Paramount chief Mpezeni has told the PF rally in Luangeni that he supports no particular presidential candidate. And the PF has promised to pay the 100 million Kwacha which Mpezeni owes Alliance one Company. The PF has also bought all the maize from Chief Mpezeni´s palace in a bid to seek his endorsement. The PF has also promised Mpenzeni that when PF forms government, he will be allowed to nominate two Ngonis which Sata will appoint ministers. 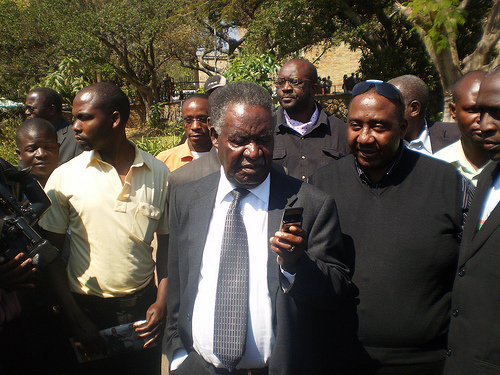 The promises were made when PF leader Micheal Sata and his entourage visited Mpezeni at his palace on Saturday. At the first meeting with Sata on Saturday, the PF only made verbal promises and Mpezeni refused to accompany them to the rally in Chipata. The PF team led by Kasama MP Geoffrey Mwamba (GBM) went back at night with cash and purchased all the bags of maize at the palace. They promised him that if he would just appear at the rally, then they will also pay his debt of K100 million. The K100 million debt has been given Mpezeni a headache for some time now. It is not clear how he obtained the credit from Alliance one, an agro company except that it was a pure business deal. But the company’s lawyers, Musa Mwenye (LAZ president) last week sent bailiffs to grab property from Mpezeni’s palace. He was only saved after some government officials intervened and pleaded for more time. The offer by the PF to settle this debt enticed the paramount chief who went to the rally drunk. It seems he passed through a bottle store on his way to Luangeni. Mpezeni has been complaining that there are no Ngoni ministers in the MMD government. He has alos been at loggerheads with PF candidate Lameck Mangani as he accused him of taking up a parliamentary seat which should be occupied by a Ngoni. Mangani is Chewa. To iron out the fight between Mpezeni and Mangani, the PF has reached a deal that Mangani should be allowed to stand in Chipata central but that Mpezeni will give Sata two Ngonis that will be nominated MPs and appointed ministers. The PF also promised that GBM will build Mpezeni a palace and that Mpezeni will be put on a monthly salary. But what Mpezeni is not revealing is that his personal friend and fellow Ngoni Kazembe Daka is standing on the MMD ticket. Kazembe Daka was the PF candidate in 2006. Despite the promises and money Mpezeni got from the PF, he still told the rally that he supports no particular candidate. Mpezeni howver advised that those who are not happy to be in particular political parties are free to leave and join others. But all the other Ngoni chiefs refused to attend the rally or even to meet Sata.